Eight wings tossed in our own authentic jerk spices and sauce. Eight bone-in wings baked and tossed in our own Island Spice Coconut BBQ Sauce. 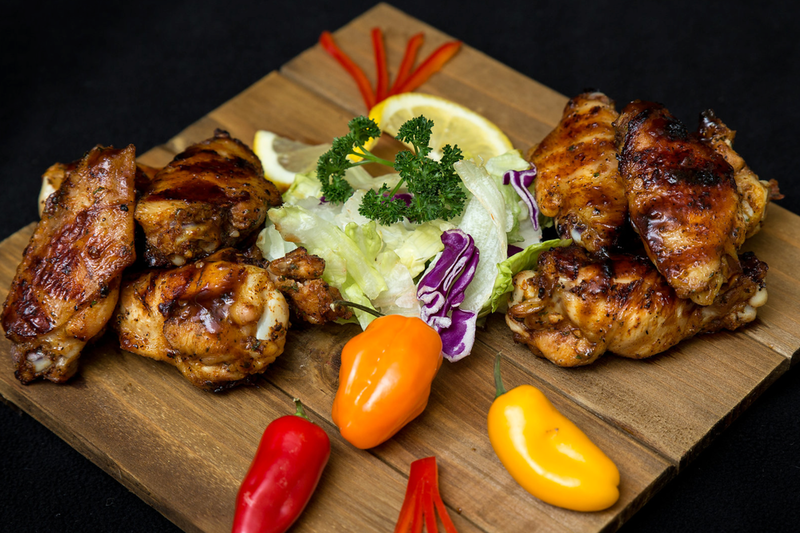 Cubes of chicken marinated in our authentic jerk spices, and grilled to perfection. Served with rice and peas, white rice, or mashed potatoes Includes veggies of the day and plantains. Chef Specials are made to order, please allow prep time. Pasta with an Island Spice twist with Jamaican spices, bell peppers, and onions, in a homemade "Italy-meets-Jamaica" cream sauce on a bed of penne. Jumbo pieces of shrimp sautéed with fresh vegetables. Please note: "From The Sea" menu items require additional prep time. Served with white rice. Substitute rice and peas for addt'l charge. (Excludes Reggae Chop Suey) Light & Fit dishes are made to order, please allow prep time. Fresh Bok choy, sweet peppers, onions, broccoli and carrots sauteed in our house brown sauce. Stir-fried rice with fresh cabbage, broccoli, carrots, sweet peppers, onions and homemade spices. "Ackee" is Jamaica's National's Dish, "Ackee" is an exotic fruit unique to tropical origins, that is seasoned with traditional spices and complements with salt fish. "Callaloo" is Jamaica's leafy green vegetable. Grilled dark meat Jerk Chicken marinated in our signature jerk spices and sauce. Soft drinks (Free refills), D&G Jamaican Sodas, Ting, Calypso Lemonades, and more topical juices. Island Spice Grille & Lounge reserves the right to monitor and control alcohol consumption. Lunch Specials served with rice and peas or white rice, steamed vegetables, fried plantains, and a free fountain drink. Served with french fries; substitute veggies, plantains or rice for additional charge. No substitutions to side items. Check out our recap of the Island Spice NYE 19 Celebration!!! Message: Saturday, I decided to try your place recommended by a coworker. I like the Carribbean feel as I parked in front of the restaurant. The establishment was clean and the staff was professional. I received the lunch menu shaped like a rectangle and laminated and very clean. Items were presented professionally and easy to read. I chose the Jamaican meat patties (2 for 5 bucks) and was impressed with the flavors and spices with a flaky crust. I ordered the chicken curry. The lunch special came with a fountain drink. I didn't have to wait too long for a good meal. The curry came with 3 nice pieces of dark chicken with the bone, not overly done just perfect covered with a delicious yet savory curry sauce over it. Peas and rice was tender, 1 piece of plaintain and sautéed cabbage. Perfect serving for lunch. Not too much just perfect. The atmosphere was relaxing, enjoying the Jamaican music. Overall experience was excellent and I recommend this place highly. Oh I'm a food and restaurant critic and out of 5 stars, 5 being excellent, Island Spice gets a rating of 5.